قاسمی, سید احمد, حسینی, سیدجواد. (1397). ساختار جمعیتی ماهی شوریده (Otolithes ruber) در سواحل شمالی خلیج فارس. فصلنامه محیط زیست جانوری, 10(2), 135-142. سید احمد قاسمی; سیدجواد حسینی. "ساختار جمعیتی ماهی شوریده (Otolithes ruber) در سواحل شمالی خلیج فارس". 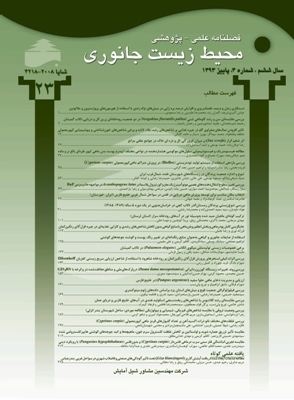 فصلنامه محیط زیست جانوری, 10, 2, 1397, 135-142. قاسمی, سید احمد, حسینی, سیدجواد. (1397). 'ساختار جمعیتی ماهی شوریده (Otolithes ruber) در سواحل شمالی خلیج فارس', فصلنامه محیط زیست جانوری, 10(2), pp. 135-142. قاسمی, سید احمد, حسینی, سیدجواد. ساختار جمعیتی ماهی شوریده (Otolithes ruber) در سواحل شمالی خلیج فارس. فصلنامه محیط زیست جانوری, 1397; 10(2): 135-142. ماهی شوریده Otolithes ruberیکی از ماهیان تجاری مهم خلیج فارس می­ باشد. در این تحقیق با به­ کارگیری روش چندشکلی طولی (AFLP) ساختار جمعیتی و میزان تنوع این گونه در 6 منطقه خورموسی، هندیجان، گناوه، بوشهر، دیر و عسلویه بررسی گردید. در مجموع 345 باند با به ­کاربردن 7 جفت پرایمر انتخابی (3+) به ­دست آمد که به طورمیانگین 37/2% چندشکلی را نشان می دادند. بیش ­ترین و کم ­ترین درصد پلی ­مورفیسم به ­ترتیب با جفت پرایمر(E-AAG/M-CAT(39% و E-ACA/M-CAG (%25 حاصل گردید. میانگین تنوع ژنتیکی (h) و شاخص شانن به ­ترتیب 0/28 و 0/46 محاسبه شد. در جمعیت بوشهر بیش ­ترین میزان شاخص تنوع ژنتیکی و شاخص شانن (I) به ­ترتیب به ­میزان 0/33 و 0/5 به ­دست آمد. ارزش شاخص Fst در بین جمعیت­ ها در محدوده 0/022 تا 0/23 بود. شاخص Fst و آنالیز AMOVA اختلاف معنی­ داری را بین جمعیت­ ها نشان می ­دهند. براساس آنالیز Fst و دندروگرام شباهت افراد، سه جمعیت از ماهی شوریده در خورموسی، بوشهر و دیر قابل تفکیک می ­باشد. اما تمایز ژنتیکی بین جمعیت­ ها بالا نبود. اسکندری، غ.؛ سواری، ا.؛ کوچنین، پ. و تقوی ­مطلق، س. ا.، 1392. روند ساختار طولی صید، ضرایب مرگ و میر و بهره­ برداری ماهی شوریده (Otolithes ruber) در 5 سال گذشته در شمال­ غربی خلیج فارس. مجله علمی شیلات ایران، شماره8، صفحه90. سالاری ­علی ­آبادی، م.ع.؛ راستگو، ع.ر.؛ محمدی، م.؛ ارچنگی، ب. و قاسمی، س. ا.؛ 1390. ساختار جمعیتی ماهی سنگسر معمولی (Pomadasys kaakan Cuvier, 1830) با استفاده از نشانگرهای مولکولی AFLP در خلیج فارس. علوم و فنون شیلات، سال 1، شماره 1، صفحه 27 تا 37. شریفی، م.؛ سوری ­نژاد، ا.؛ حسینی، ج.؛ قاسمی، ا. و فقیه، ا.، 1391. بررسی تنوع ژنتیکی ماهی حلواسیاه Parastromateus niger در سواحل ایرانی خلیج فارس با استفاده از نشانگر ملکولی AFLP . مجله بوم شناسی. دوره 2، شماره 2، صفحات 61 تا 81. فقیه ­احمدانی، ا.؛حسینی، س.ج. و قاسمی، س.ا.، 1390. مطالعه کروموزومی ماهی مید Liza klunzingeri و بررسی تنوع ژنتیکی آن در خور زیارت (استان بوشهر) و رودخانه زهره (استان خوزستان) با استفاده از نشانگرAFLP . پایان ­نامه کارشناسی­ ارشد، دانشگاه آزاد اسلامی واحد ا هواز. 83 صفحه. فکراندیش، ح.؛ کمالی، ا.؛ حسینی، س.ج. وسلطانی، م.، 1392.مطالعه تنوع ژنتیکی ماهی زمین­ کن دم­ نواری (Platycephalus indicus Linnaeus, 1758) در خلیج فارس با استفاده از نشانگرهای AFLP. رساله دکتری، دانشگاه آزاد اسلامی واحد علوم و تحقیقات تهران. 125 صفحه. نصری، م.؛ قاسمی، ا. و قریب ­خانی، م. 1395. بررسی تنوع ژنتیکی ماهی شوریده (Otolithes ruber) در خلیج فارس و دریای عمان با استفاده از توالی­ یابی ژن 16s rRNAمیتوکندریایی. مجله علمی- پژوهشی زیست ­شناسی دریا. سال 8، شماره 31، صفحات 1 تا 12. Excoffier, L., and Lischer, H.E., 2010. Arlequin suite ver 3.5: a new series of programs to perform population genetics analyses under Linux and Windows.Molecular ecology resources. Vol. 10, No. 3, pp: 564-567. Excoffier, L.; Laval, G. and Schneider, S., 2005. Arlequin version 3.0: an integrated software package for population genetics data analysis. Evolution Bioinformatics. Vol. 1, pp: 47-50. Excoffier, L.; Smouse, P.E. and Quattro, J.M., 1992. Analysis of molecular variance inferred from metric distances among DNA haplotypes: application to human mitochondrial DNA restriction data. Genetics. Vol. 131, pp: 479-491. IUCN (International Union for Conservation of Nature). 2007. The IUCN red list of threatened species, Available: http: //www. iucnredlist.org. Liu, Z., 2007. Aquaculture Genome Technologies. First edition, Blackwell Publishing, Australia. 551 p.
Liu, F.; Shi, H Z.; Guo, Q.S. ; Lv, F.; Yu, Y.B. ; Lv, L.L. and Zhang, M.M., 2015. Analysis of the genetic diversity and population structure of Perinereis aibuhitensis in China using TRAP and AFLP markers. Biochemical Systematics and Ecology. Vol. 59, pp: 194-203. Mickett, K.; Morton, C.; Feng, J.; Li, P.; Simmons, M.; Cao, D.; Dunham, R.A. and Liu, Z., 2003. Assessing genetic diversity of domestic populations of channel catfish (Ictalurus punctatus) in Alabama using AFLP markers. Aquaculture. Vol. 228, pp: 91-105. Mughal, M., 2013. Persian Gulf Desert and Semi-desert. Biomes & Ecosystems. Vol. 3, Robert Warren Howarth (ed.). Ipswich, MA: Salem Press. pp: 1000-1002. Nei, M., 1972. Genetic distance between populations. Am. Nat. Vol. 106, 283e292. Nei, M. and Li, W.H., 1979. Mathematical model for studying genetic variation in terms of restriction endonucleases. Proc. Natl. Acad. Sci. USA. Vol. 76, pp: 5269-5273. Peakall, R. and Smouse, P.E., 2006. GENALEX 6: genetic analysis in excel. Population genetic software for teaching and research. Molecular Ecology. Vol. 6, pp: 288-295. Qian, X.; Fei, C.; Shin, P.K.S. ; Cheung, S.G.; Yan, C. and Caihuan, K., 2011. AFLP analysis of genetic variation among three natural population of horseshoe crab Tachypleus tridentatus along Chinese coast. Chinese journal of Oceanology and limnology. Vol. 29, pp: 284-289. Reed, D.H. and Frankham, R., 2002. Correlation between fitness and genetic diversity. Conserv. Biol. Vol. 17, pp: 230-237. Sambrook, J. and Russell, D.W., 2001. Molecular cloning: a laboratory manual. Cold Spring Laboratory Press, NewYork. Smith Vaniz, W.F., 1984. Carangidae: relationships. In: Moser, H.G., Richards, W.J., Cohen, D.M., Fahay, M.P., Kendall Jr., A.W., Richardson, S.L. (Eds. ), Ontogeny and Systematics of Fishes. Am. Soc. Ichthyol. Herpetol. Spec. Publ. Vol. 1, pp: 522-530. Song, N.; Zhang, X.M. and Gao, T.X., 2010. Genetic diversity and population structure of spottedtail goby (Synechogobiusommaturus) based on AFLP analysis. Biochemical Systematics and Ecology. Vol. 38, No. 6, pp: 1089-1095. Vos, P.; Hogers, R.; Bleeker, M.; Reijans, M.; Van de Lee, T.; Hornes, M. and Zabeau, M., 1995. AFLP: a new technique for DNA fingerprinting. Nucleic acids research. Vol. 23, No. 21, pp: 4407-4414. Wang, Z.Y. ; Jayasankar, P. and Khoo, S.K., 2000. AFLP fingerprinting reveals genetic variability in common carp stocks from Indonesia. Asian Fish. Sci. Vol. 13, pp: 139–147. Xu, Q.; Chen, F.; Shin, P.K. ; Cheung, S.G.; Chen, Y. and Ke, C., 2011. AFLP analysis of genetic variation among three natural populations of horseshoe crab Tachypleus tridentatus along Chinese coast. Chinese Journal of Oceanology and Limnology. Vol. 29, pp: 284-289. Yao, X.; Deng, J. and Huang, H., 2012. Genetic diversity in Eucommia ulmoides (Eucommiaceae), an endangered traditional Chinese medicinal plant. Conserv. Genet. Vol. 13, pp: 1499-1507. Young, W.P. ; Wheeler, P.A. ; Coryell, V.H. ; Keim, P. and Thorgaard, G.H., 1998. A detailed linkage map of rainbow trout produced using doubled haploids. Genetics. Vol. 148, pp: 839-850. Yuan, L.; Hu, C. and Zhang, L., 2013. Population genetics of a tropical sea cucumber species (Stichopus monotuberculatus) in China. Conserv. Genet. Vol. 14, pp: 1279-1284. Zhang, H.; Yu, H.; Gao, T.; Zhang, Y.; Han, Z. and Xiao, Y., 2012. Analysis of genetic diversity and population structure of Pleuronectes yokohamae indicated by AFLP markers. Biochemical Systematics and Ecology. Vol. 44, pp: 102-108. Zhao, F.; Dong, Y.; Zhuang, P.; Zhang, T.; Zhang, L. and Shi, Z., 2011. Genetic diversity of silver pomfret (Pampus argenteus) in the Southern Yellow and East China Seas. Biochemical Systematics and Ecology. Vol. 39, pp: 145-150.